Chaplin as the reincarnation of Dickens is an interesting thought. There is no doubt in my mind that Dickens was the most pronounced artistic influence on Chaplin’s career. 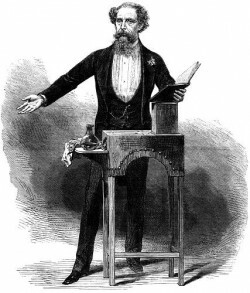 He had discovered Dickens before he could even read and even the origins of his showbiz career owed a lot to Dickens. 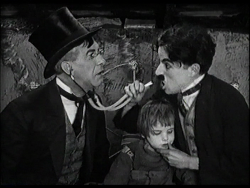 Growing up in London, Chaplin had seen the actor Bransby Williams imitating Dickens characters like Uriah Heep, Bill Sykes and the old man in The Old Curiosity Shop and it had ignited a love of the theatre and a fascination with literature. ‘I wanted to know what was this immured mystery that lay hidden in books,’ he wrote, ‘these sepia Dickens characters that moved in such a strange Cruickshankian world. Although I could hardly read, I eventually bought a copy of Oliver Twist.’2 He was so enthralled with these Dickens characters that he began imitating Bransby Williams imitating them; and it was then that he was discovered and invited to make his stage debut. What is particularly intriguing about this is that Dickens as a boy used to console himself in the same way by impersonating favourite characters from novels he had read (particularly those of Fielding) and that his early ambition was a career on stage. To the end of his life he was a frustrated actor, liking nothing better than giving public readings of his description of the murder of Nancy in Oliver Twist and then enquiring politely how many women in the audience had fainted. The first extract was, of course, the famous shower-murder in Psycho, made in 1960, the murder accentuated by perhaps the most celebrated musical cue in film history, Herrmann’s famous screaming violins that highlight the heroine’s screams but also the stabbing knife. The second extract was the credit sequence of Torn Curtain, made in 1966, and some of you might have noticed that it says ‘Music by John Addison’. Actually the music you heard was by Bernard Herrmann, arguably the most notorious piece of film music ever written because it brought to an end – and an abrupt and hostile end – this great director/composer partnership. The orchestra liked it: indeed, after they’d played it, they burst into spontaneous applause, so it came as something of a surprise to them that, when Hitchcock heard it, he was angry and upset, cancelled the remainder of the session, and severed a partnership that had served him well – nay, brilliantly – over 11 years and 9 films. My talk then is centrally concerned with what happened on that fateful day in March 1966 (surely the most dramatic recording session in Hollywood history) and why it happened. It is a complex and even mysterious story with some still unanswered questions, but very revealing about the individual personalities of two extraordinary artists and of two competing egos and insecurities. I also want to assess different accounts of what happened, offering my own interpretation but basing this too on what people who were close to the event have told me. But to understand it fully, one needs to contextualise it a bit; and in this regard, I want to say a few things about the partnership of Hitchcock and Herrmann in its prime. Everything on this site is written by Neil Sinyard. This site is maintained by David Rolinson, whose contact details can be found over at our sister site, British Television Drama, which also includes a piece by Neil on the drama about Hitchcock, The Girl.